THE HESLOP HOUSE: PRITTY IN PINK? So, just when you think you've instilled all the precious values in your children, WHAM! you capture a photo like this. 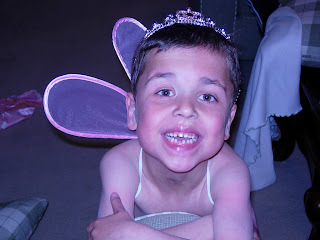 Brandon was begging me not to, as he was demanding conner de suit from the fairy costume, but really i couldn't help myself. I should have known he was up to something, taylor had hannah over to play and they were being so cute, playing in the princess tent in their gowns. Conner wanted someone to play with to, so I assured him it was o.k. to go play with the girls, painless really right? In my defense, i didn't know he would take me literally! I tried to explain to him he was suppose to be the fiery dragon that locked the princess in the tower, but he said that was too scary, little did he know the tutu he was sporting was just as scary. His little escapade ended shorty after his father saw him, but i got some photos just for kicks! Just a shout out to all my friends, i want you all to know how grateful i am to have you. I have had an experiance of a lifetime here in moses, with so many people i feel so close to. i love all of you and i look forward to many years of friendship. it truly does make life complete to have friends. my favorite quote on friends "truly great friends are hard to find, difficult to leave, and impossible to forget." so many good memories i'll always have. and hopefully yall will have some of me! some of you are probably scarred for life with my little secrets, but atleast we laugh, right. to the grave ladies! Um, Is Connor wearing lipstick?! 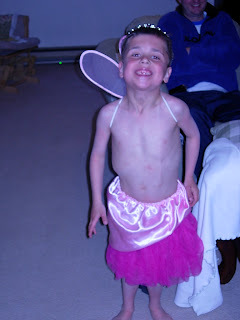 That's pretty funny, and I would have had to take a picture of my boy dressed as a fairy, too! The recipe sounds good too, I will have to try it. I am totally in to quick fixins. to the grave.... criss cross applesauce. And Stephen says, "if you ever do that to Beck.."
I think every boy has to go through "experimental" stage right? love love having you guys here.